Finding inexpensive breakfasts in the U.S. is like hitting the ocean with a rock tossed from the beach. Prices go up north of the border, especially in big cities and resort communities. 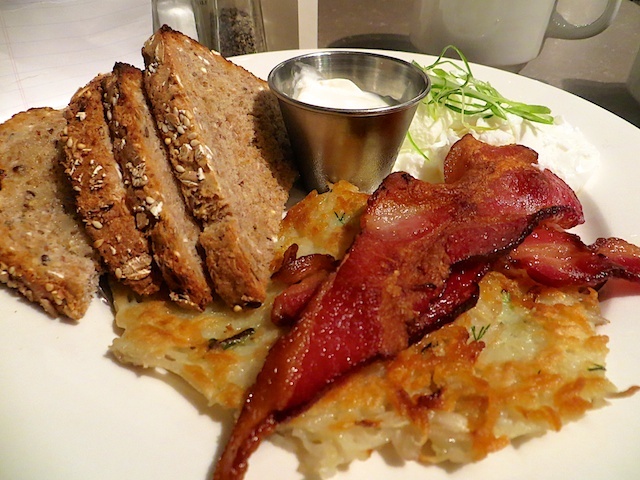 In Calgary, there are lots of places that will set you back $15 for a morning feed. Sure, some are cutting edge—think potatoes cooked in duck fat or eggs Benedict topped with Prosecco hollandaise. But sometimes, all you want is a basic breakfast that won’t break the bank. 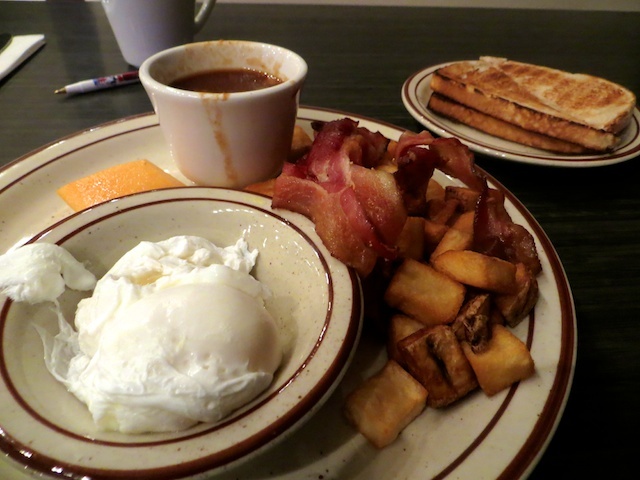 With a little digging, I’ve unearthed some Calgary breakfasts for under $10. Certainly, some are a little greasy, the venues character places. 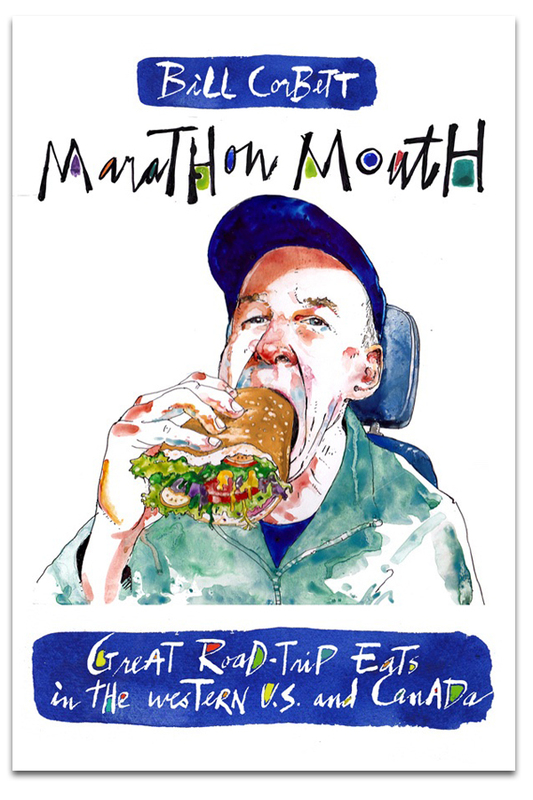 But others offer first-rate meals for a pittance. I’ve broken them into two parts: full breakfasts and light bites. Perched on the edge of downtown Calgary, *Grumans Delicatessen is built for a lunch crowd eager to devour smoked-meat sandwiches, slow-roasted beef brisket and fine potato salad. But when I roll in a little after 7 am on a Monday, the place is empty. What all those folks streaming past on their way to work are missing is maybe the best breakfast deal in Calgary. It’s Grumans early-bird special, available from 7 to 9 am weekdays. For the amazing price of $7 (including tax), I get two perfectly poached eggs, two thick slices of double-smoked bacon, two feathery latkes (potato pancakes) and some nice multi-grain toast. Oh, and endless cups of great coffee from local roaster Angel’s beans. Another reason to go early: Free on-street parking till 9 am. Grumans is owned by long-time Calgary restaurateur Peter Fraiberg (born in Montreal, natch), whose recipes, historic photos and words of Jewish wisdom on the walls borrow heavily from his mother, or “Bubby”. Talk about false advertising. 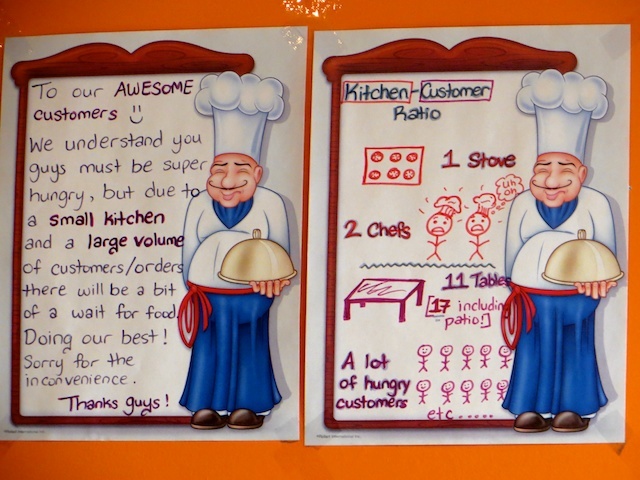 A handmade sign on the wall at John’s Breakfast & Lunch warns there will be a bit of a wait for the small kitchen to prepare ordered meals. But I’ve hardly had time to digest this news when my veggie eggs Benedict arrives. Admittedly, it’s a weekday mid-morning, and there are just a handful of regulars, including a couple of uniformed cops, in attendance. Still, I didn’t realize perfectly cooked poached eggs could be produced so fast. It’s a big platter of food, with a pond of hollandaise over the two eggs and a generous helping of home-cooked potatoes. And it’s a real deal at $8.50 (a buck more with ham). 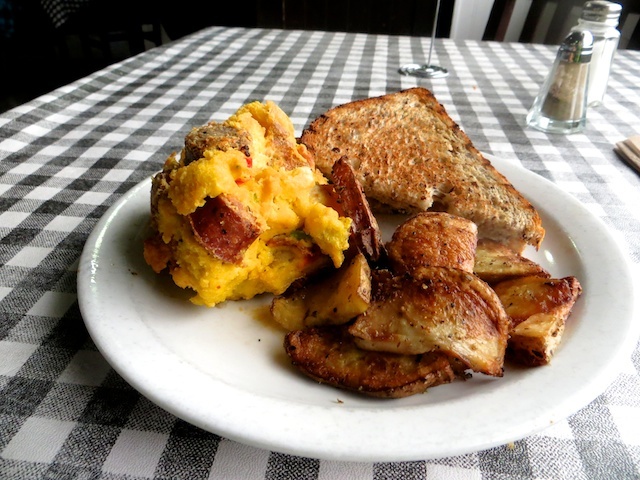 All-day breakfasts with all the fixings run for as little as $7.50, with a long list of omelettes starting at $9. This northwest neighbourhood hangout is casually but efficiently run by a couple—John, who does the cooking, and Wendy, who runs the front. Marketing is strictly word of mouth, with no business cards, website or cute name. Heck, the name of the previous incarnation, Café Boutique, is still on the front windows some six years later. What this means for customers, though, is great prices for tasty, well-prepared breakfasts. You’ve heard of a deer in the headlights? 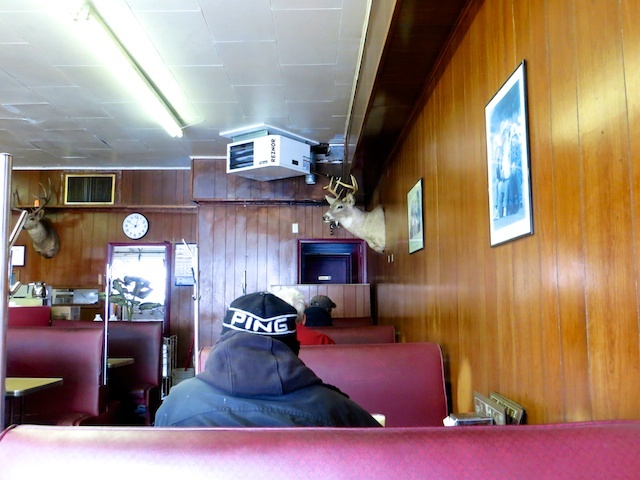 Well, at Deer Head Café, I’m the one caught in the glassy-eyed gaze of, you guessed it, three wall-mounted deer heads. This may not be environmentally fashionable among those flocking to trendier breakfast digs scant kilometres south on Edmonton Trail. But I don’t imagine it matters much to the folks who frequent this little industrial-area diner, where time has stood still for most of its 67 years. The frayed nylon booths have duct-tape patching, and the little clipboards that hold the written orders are from the distant past. The prices and the menu, too, are old fashioned. My $6.50 bacon and cheese omelette arrives hot and fast, with a crispy side of hash browns and “white or brown” toast. For about the same price, I could order something you don’t see on modern menus: pork chops and eggs. In all, it’s a decent breakfast, with a heaping amount of character. Update: The Grey Eagle Casino breakfast special has shot up in price, all the way to $4.99. 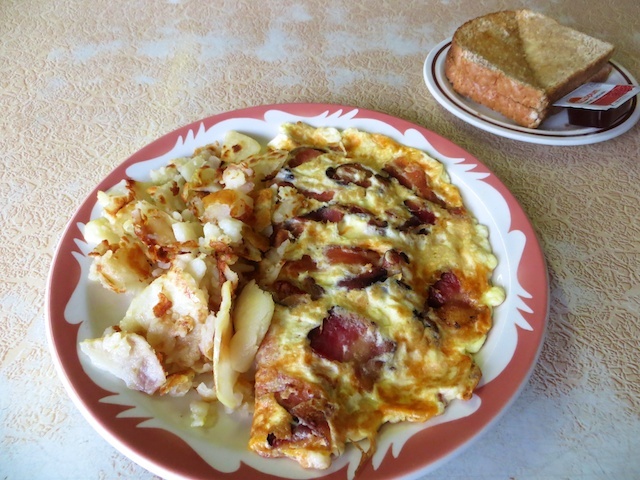 A big hike but still likely the cheapest full breakfast you’ll find in the city. Is a $1.99 breakfast a gamble? Not at Grey Eagle Casino, on Tsuu T’ina First Nation lands in southwest Calgary. Like the free drinks in Las Vegas, the bargain-basement breakfast special at Grey Eagle is obviously intended to lure bettors in the door. It seems to be working, though maybe the some 50, mostly older, folks gathered in deep, semicircular booths in the spacious dining room are here just for a cheap mid-morning feed. A trolley rolls past, containing trays topped by hospital-style beige lids. Under the lid is a full breakfast: two eggs (in my case poached), bacon, hash browns, toast, a little dish of beans and a slice of cantaloupe. Is it a great breakfast? No. The ingredients are somewhat second rate and the meal is lukewarm. But, hey, you get what you pay for, and it’s certainly the biggest bang for your buck outside of an IKEA restaurant. As long as you stay away from all those glittering slot machines on the way out. I do and find a dime on the ground outside, lowering my net cost to under $2, tax included. I’ve written before about the great lunch deals—especially the Big Pan meals like butter chicken and curries—at Sunterra Market, a combination of upscale grocery and quick-food restaurant. They also serve inexpensive breakfasts at most of their Calgary locations. Expect to pay about $6 for bacon, eggs, toast and maybe a fruit cup. The west Calgary spot I visit is certainly popular, with window-side tables full of folks munching on full brekkies, scones and cinnamon buns, tossed down with coffee. Unfortunately, my $6 chorizo frittata special doesn’t deliver. The frittata is hard and dry, the culprit a warming lamp keeping already cooked and cut wedges scarcely alive—a definite no-no. As well, the potato slices are tired looking and the toast unbuttered. I should have ordered poached eggs or the prime-rib omelette special, items that have to be cooked to order. 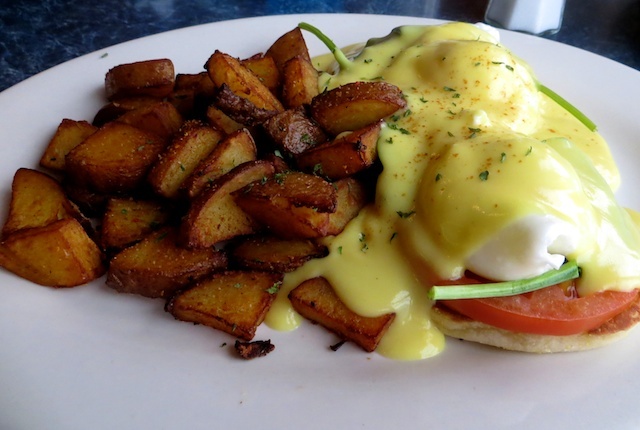 This entry was posted in Alberta, Alberta restaurants, breakfast, Calgary and tagged Cheap Calgary Breakfasts on April 4, 2014 by bcorbett907. 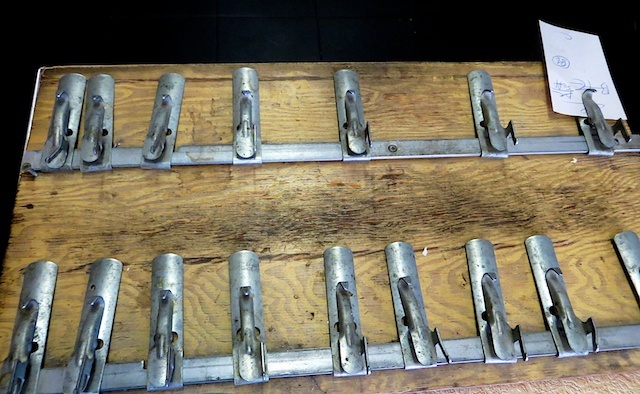 Great newsletters but why do they come scrambled with numbers this week…Wordpress problem? They look fine on my screen, but I’ve been sending them remotely from my iPad, so maybe that’s the problem. loved the article, will be checking some of these offerings soon. btw,I have a great memory of walking to the Blackfoot Truckstop Diner w Neva. Have you checked it out recently? Haven’t been to Blackfoot Truck Stop for years. Seem to remember the flapper pie. Might be time for another visit. And maybe to Lido’s which is closing its doors soon. Blackfoot Truck stop..we go twice yearly. they have great breakfasts and even better pie. Two words: Perogy plate. I’d better get down there. Try Billy burgers ” cowboy” breakfast . Just a little more south of the Deerhead cafe. On the west side of Edmonton Tr. it maybe greasy but where else can you order a full Chinese diner or an awesome bowl of chicken sauté war wonton while buddy has a Cowboy breakfast!